Design: Farmlett, Barsanti & Assoc. 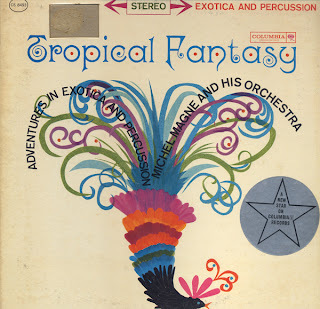 Lushly orchestrated if somewhat mild exotica from Dave Miller. Well executed glossy cover art gives the feel of a cover printed somewhat later. Billboard also like the image calling the cover a "big display-plus". 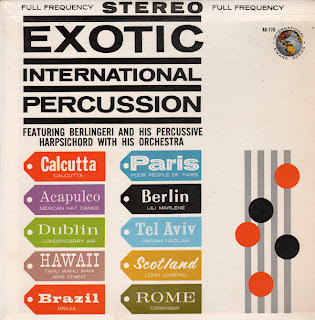 Oddly, only the last track on the B side, "Kashmiri Song" features some stock "bird" sounds as a lead-in to the tune which quickly becomes a standard mood number. Local, Cincinnati, Ohio, vanity press Christmas album with references to Bible numerology on the back cover. "The number 3 appears 7 times (on the cover). 3 Children, 3 Toys, 3 Candles, 3 Logs, 3 Piece Brass Fireplace Set, 3 Stockings and 3 Toys In Each Stocking. With the note that this 3-7 thing was "unplanned". There is also a note where the photo was taken and who the children are (Robyn, Wesley and Jonathan). 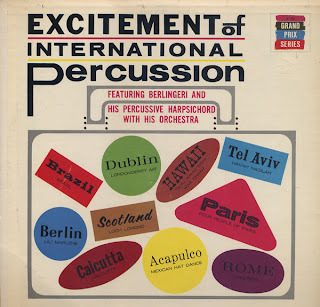 Folks just don't make recordings like this anymore, or at least package them this way. Rusty York is credited as an engineer. His name more frequently appears in association with Jewel Records. 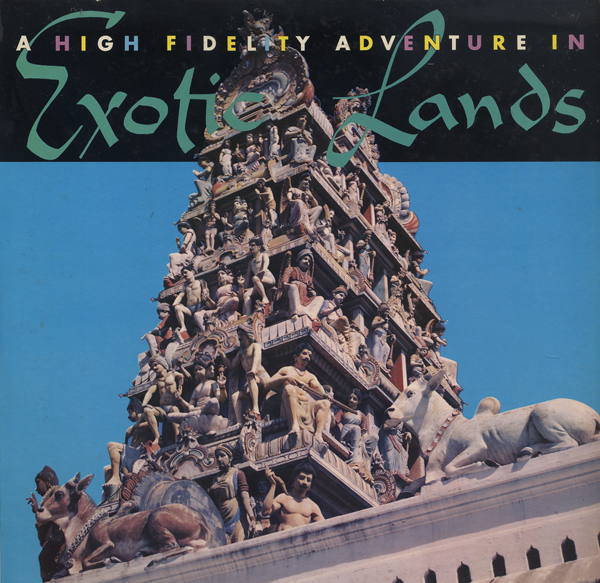 Holy crap... just when I thought that I had collected some of the best exotica albums, including Frank Hunter's White Goddess, I find this record. Of course, collecting music is all personal taste, but if I had started collecting exotica with this LP all other additions to the library might seem lacking by comparison. Some might say that this recording is too heavy on effects. I love it and the songs never seems silly or cheesy. It is almost impossible to pick a sample track to share as every track is so different and wonderful. 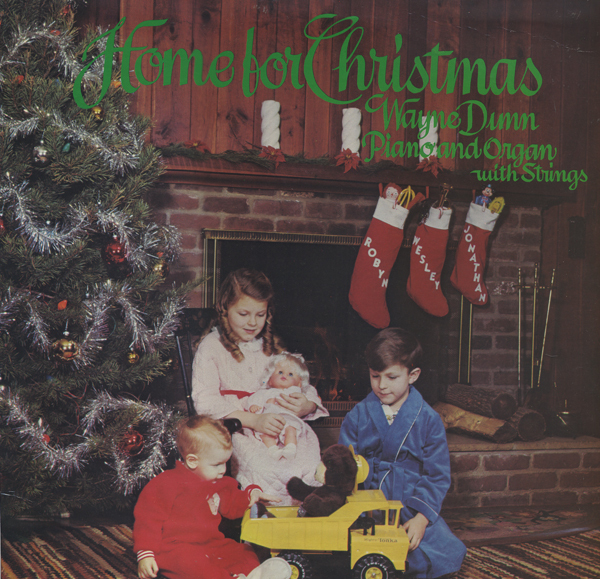 Recorded (with two track equipment if you can believe it) in France and released in the U.S. by Columbia. 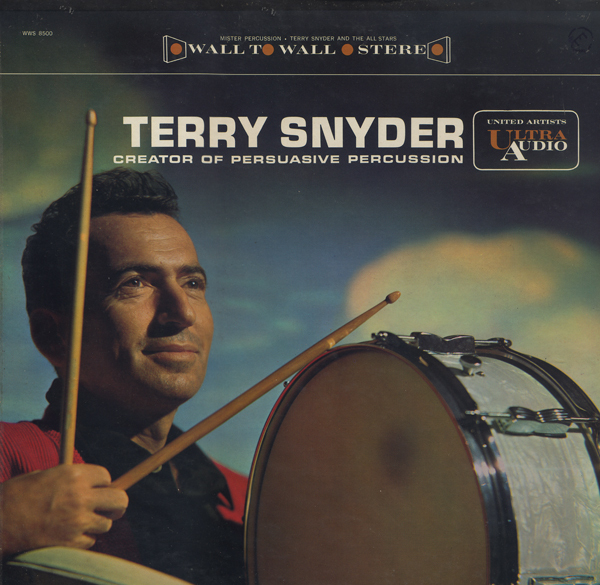 Snyder worked on the first four Command Label Persuasive Percussion sets. For this project United Artists replicated the look and sound of those successful packages right down to the book-fold jacket, minimalist jacket artwork and "ping-pong" audio effects. The arranging and engineering is top notch. From the inside cover: Terry Synder is now an exclusive Ultra Audio recording artist. He was signed to initiate Ultra Audio's new series of brilliant sound albums, albums that set new standards for the record industry from both a musical and a high fidelity standpoint. This is the first album by Terry Snyder on Ultra Audio and there will be others by this most talented and imaginative performer. From Billboard - August 8, 1960: Another discern entered the rapidly growing specialized sound LP field this month with the advent of United Artists new subsidiary Ultra Audio Records. 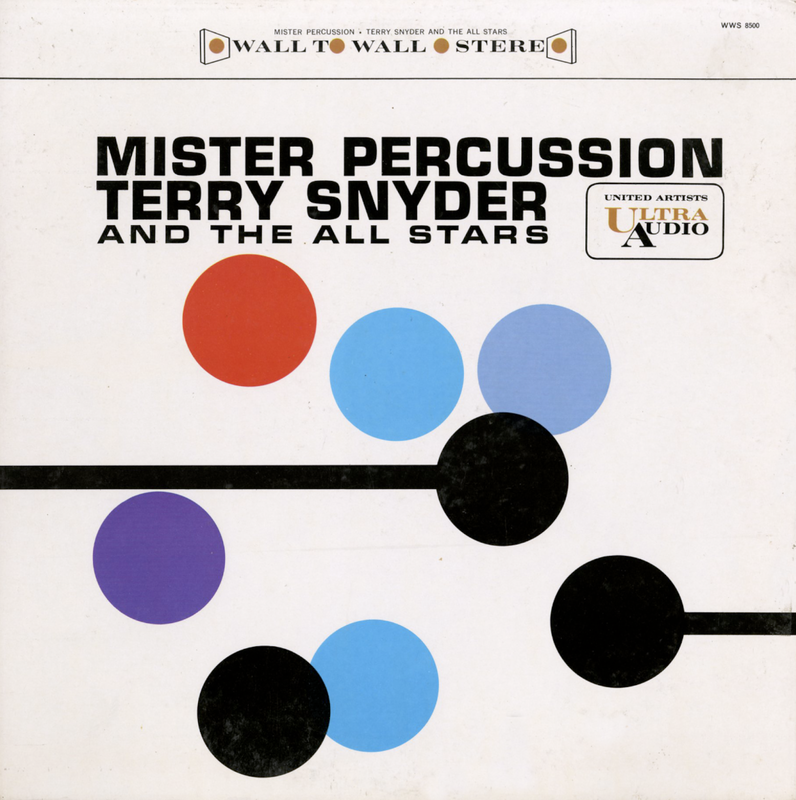 The new line will be marketed September 15, with the release of "Mister Percussion," by the newly signed Terry Snyder and the All Stars and four other packages. The acquisition of Snyder as an artist should give the new Ultra Audio line a strong send-off, since Snyder's Command LPs (for the Enoch Light-ABC Paramount label have long been top sellers in the sound field. Snyder's Command waxing "Persuasive Percussion" is currently No. 1 on The Billboard's Stereo Action Album charts. UA's Ultra Audio line will retail at $4.98 monaural and $5.98 stereo. In addition to the Snyder package, the first five Ultra Audio albums will include LP's by leading UA artists, including UA's a&r chief Don Costa and the piano team, Ferrante and Teacher. Repertoire has not yet been set, but the albums will spotlight different types of quality instrumental sounds. Don Costa will also head up a&r for the new label. UA vet-pee-general manager Art Talmadge plans to release at least 15 more Ultra Audio albums by the first of next year, with several Snyder packages included in the group. 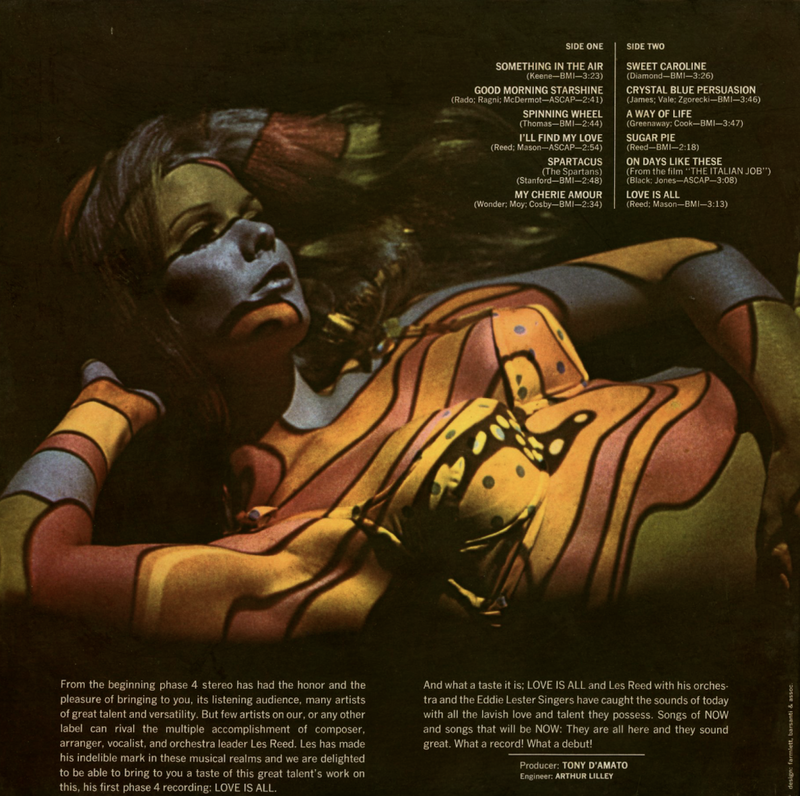 An extensive consumer ad campaign will herald the first releases. The Ultra Audio albums will be double-jacketed and will include a "secret" mechanical gimmick which will enable listeners to be their own engineers. Details of the gimmick are under wraps until next month, but it will make it possible for the listener to test his speakers and balance them correctly. Each album will be packaged in a special polyethylene container, and UA is providing dealers with specially designed display units for the line. In addition to Command, which pioneered the concept of a double-fold specially prices Sound Album, and the new Ultra Audio, the field has recently been entered by Kapp with its Medallion line, and Bob Shad's new 6000 Time LP series. Special sound packages, of course, have also been released by other diskeries, altho not under different labels. RCA Victor has "Music for Bang, Gaa-Room and Harp" by M-G-M introduced a group of "Sound Spectacular" packages last week, etc. Apparently this recording was also released on Pickwick KS-170. Grand Prix was a Pickwick reissue label. This is an early 1960s reissue. Spaceagepop lists this album as having a cover of Hawaiian War Chant on it, but that song isn't on my copy. 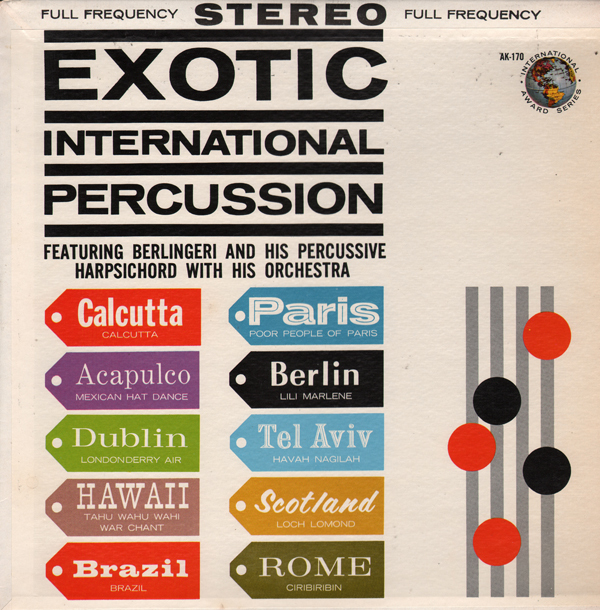 This recording is actually a pretty decent space age/ping-pong/light pop album. This is a graphically appealing, if somewhat odd album cover which features what looks like Chacksfield on the cover pointing at something. What? Maybe the Ebb Tide which was the first British instrumental to hit number #1 on the U.S. charts. I'm having trouble fitting this release into Chacksfield's Wikipedia discography. 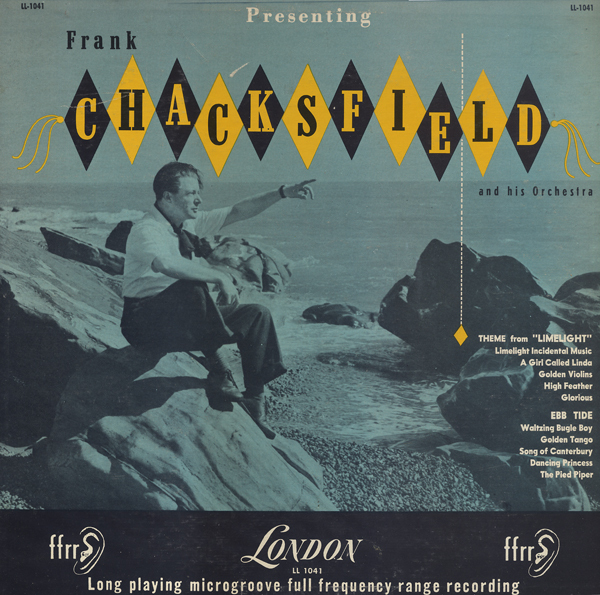 Ebb Tide, the first composition on the list, was released as London LL 1408 (although a 1956 issue of Billboard lists this London album catalog number as a release by another artist). 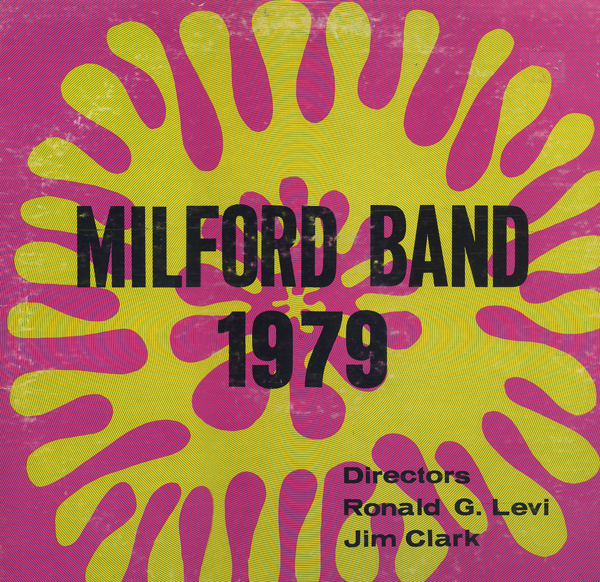 This album isn't listed on Wikipedia and appears to be earlier. The back cover is stamped May 27, 1955 and if you read the notes you might think that this record was released sometime around 1953. "In 1948, he began conducting for the BBC in association with the orchestra of Henry Hall and Geraldo and in the next five years rose amongst the most sought after maestri in Britain." 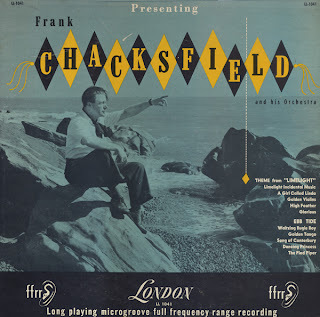 But in 1953 Chacksfield was signed with Decca. 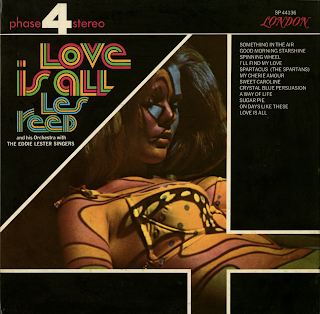 His first release for Decca featured "Limelight" which is also on this record. 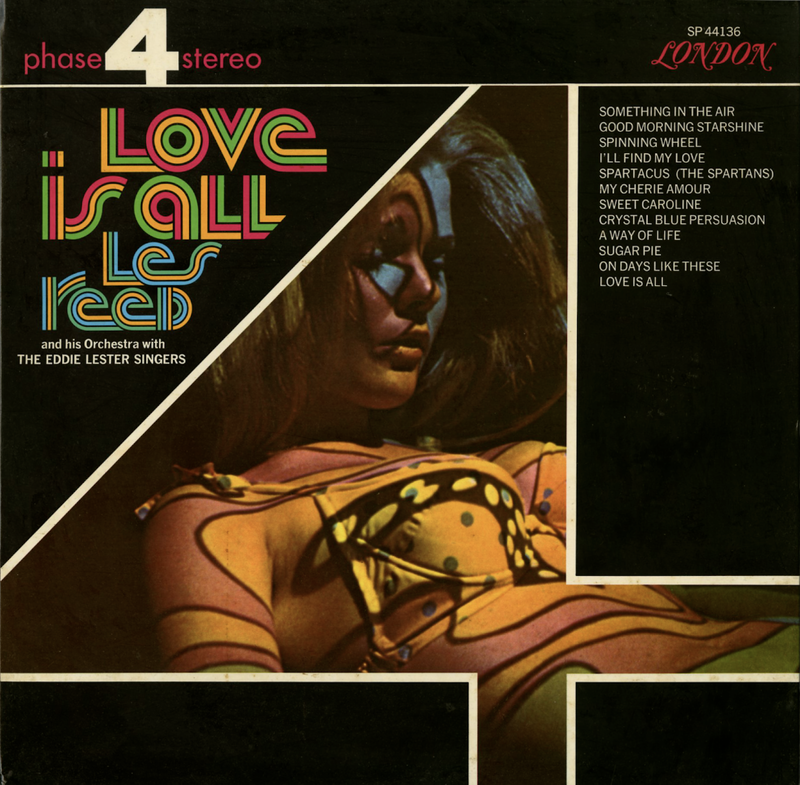 As for the music, Ebb Tide on this pressing is spiced with an ocean lead-in and out sound effects and a track titled Golden Violins features what must be an early example of reverb which gives the tune a neat space age edge. Both tunes can be the downloaded from online vendors. 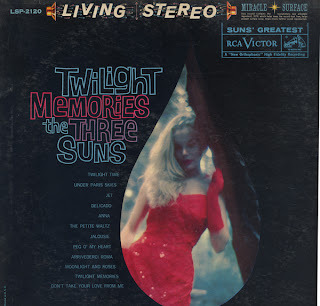 From Billboard - March 14, 1960: New recordings of the Three Suns' biggest hits, in stereo. Great for listening or dancing – suave and tasteful. Sides included are "Twilight Time," "Don't Take Your Love From Me," "Moonlight and Roses," etc. A beautiful cover will prove an effective display piece for dealers. Here's a brief clip from The Marching Band Competition Show off the A side. It's a bit Zappa/exotica. I wish they had done a longer version.